Celebrating our 10th month on the road with DOUGHNUTS in New Mexico!!! New Mexico is the 16th state we've been fortunate to further explore this year and it's easily one of our favorites! We've had the opportunity to experience the northern parts of the state in the recent past but had big bucket list dreams in the southern region that we were looking forward to. If you haven't been to some of these, hopefully this post will entice you to scoot them up higher on your must-see list (and maybe you'll add a new one to it also). 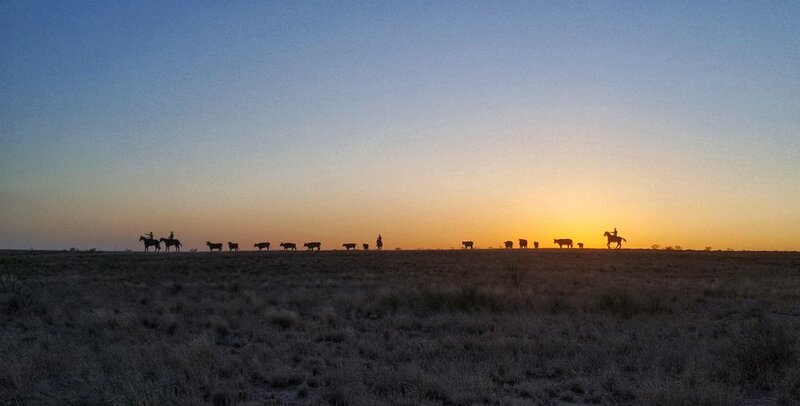 Buckle up as we road trip through 5 of the best parts of southern New Mexico (plus one incredible honorable mention!). 1. Gila Hot Springs "Glamping"
A glorious morning for a hot springs soak for the jibs. In the world of Westfalia camping with kids there have been a number of experiences I would consider glamping. A place to swim? Glamping. A river to play in? Glamping. Beach? Glamping. A playground? Still glamping. Notice all of these have one thing in common: my children are happy, occupied, and content for hours on end. This in turn means we (the parents) can relax. I know what you're thinking ("you're on a perpetual vacation for a year, for crying out loud!!! "), but all of those things leads to a deeper sense of relaxation, you feel me? Okay, and maybe a little laziness too. Gila Hot Springs was the perfect combination of all of the above. We camped next to the river where the boys played for hours in the water and sand. They built dams, threw rocks, drove their trucks, made mud pies, caught tadpoles and worms, made a house for said tadpoles and worms to live (and die) in, they played made up games and when I'd look down at the river they'd be talking nonstop then break out in an occasional laugh. Hallelujah, this is a parent's heaven! 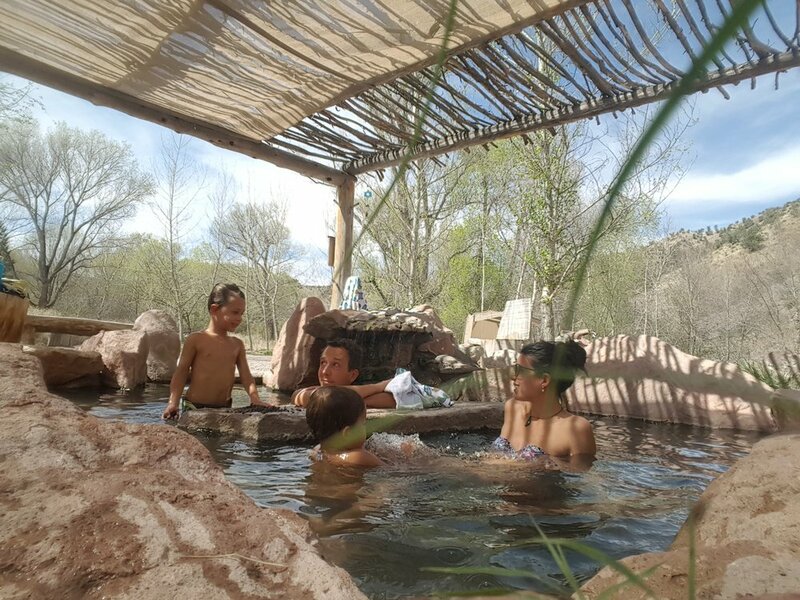 But the best glamping feature of Gila Hot Springs was...can you guess??? The hot springs!! Some pretty epic views, as well as a calm river to play in, right from our campsite. Gila Hot Springs (pronounced 'hee-la'...I know, I said 'gee-la' too!) is situated in the middle of Gila National Forest with the closest city (and any reception) being Silver City which is about an hour and a half away. As a bonus, the road that the hot springs and ranch is along also dead ends about 7 miles down at Gila Cliff Dwellings National Monument (you'll see that later). There are three decently size hot spring pools, a composting toilet, hot springs drinking tap for hot beverages, and a handful of sandy ground campsites. The owners also tend to their ranch onsite where horses and goats only added to the ambiance. The place had a rustic feel but remained natural in a sense. The pools however were recently renovated from muddy bottom to concrete which was fine with us. They've really done a beautiful job, as you can see! We spent morning, afternoon, night round 1 (pre kid-bedtime), and night round 2 (post kid-bedtime clothing optional!) in the hot springs. We loved it so much that after our first night we decided to stay another. Even if you're cheap (I mean, frugal) like us, I confess it is worth the $8 per person to camp and use the springs. Nestled under the gazebo hot springs pool. I'd say on average we soaked roughly 6 hours a day. By the end we were dried up and as shriveled as a raisin. How we "write" our alpahbet on the road. Bennett scoping out the panoramic views from Gila Cliff Dwellings National Monument. Just a short jaunt down the road from Gila Hot Springs sits the picturesque Gila Cliff Dwellings National Monument. 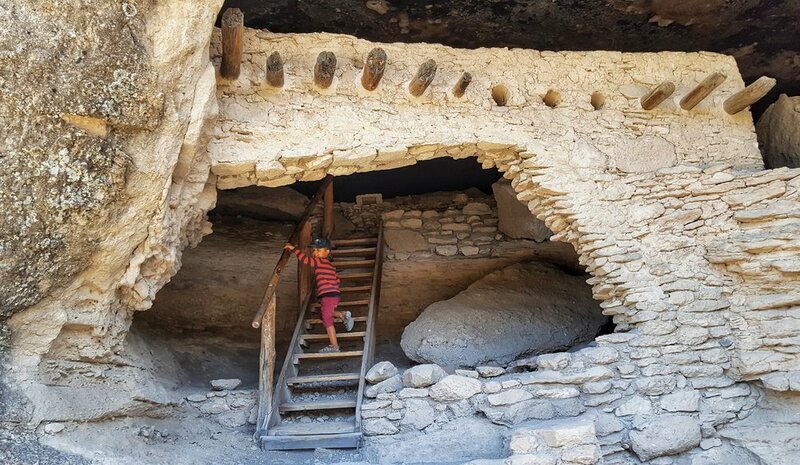 Here, we took the easy 1 mile loop through the enchanting cliff dwellings that were once home to the Mogollan Culture in the late 1200's. 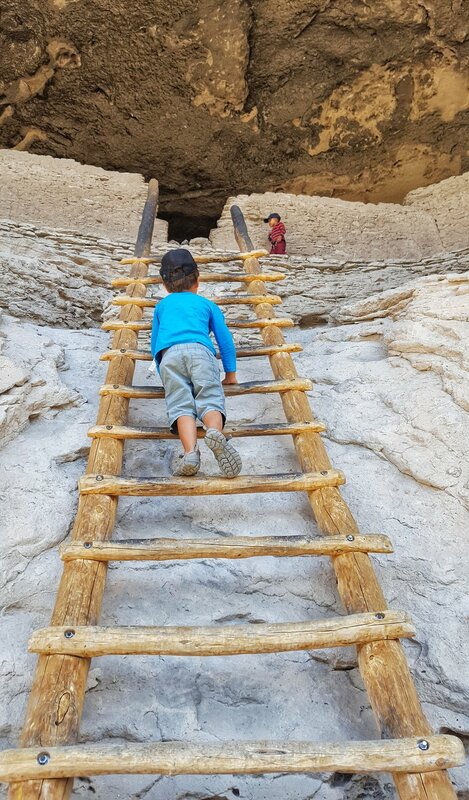 These dwellings, or caves, are perched 180 feet up making it a beautiful and fun place to explore, especially with kids. 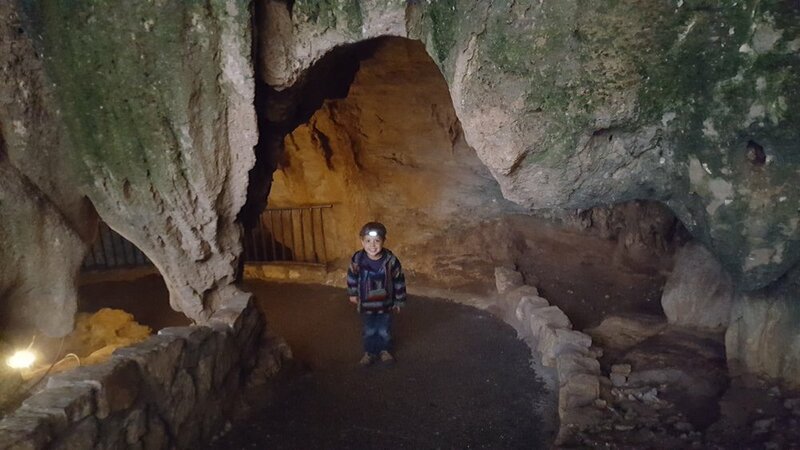 As you'll see in our photos below, within these caves are rooms that were built for families to reside in. Reid is the first one in to check out the first of many dwellings. Not pictured is the commanding view to the right! You can see why this may have been a great place for people to live back in the day - the caves were perfect for sheltering from wind, rain, sun, and snow. 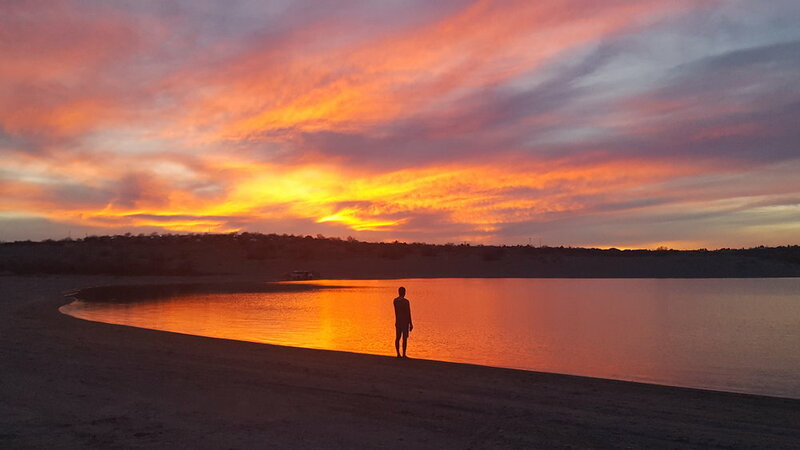 A sunset we most definitely won't forget at Elephant Butte Lake State Park, New Mexico. Reminiscent of Baja, we could not have stumbled upon a more lovely state park to camp after spending two chilly weeks in Colorado. 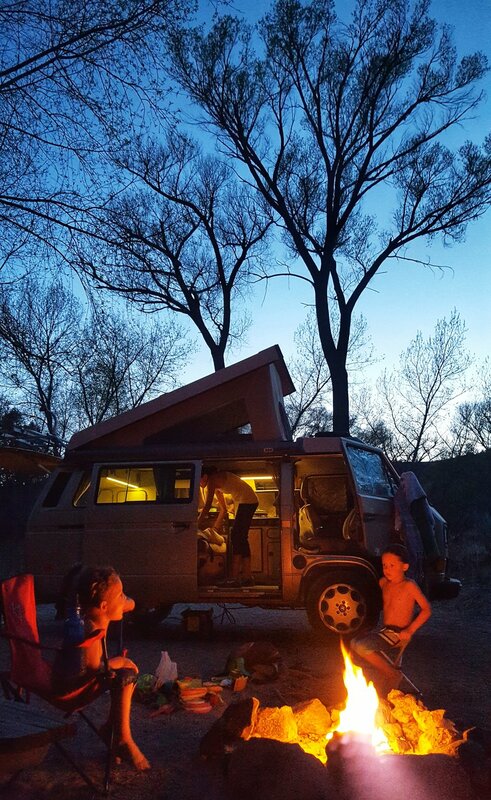 Elephant Butte Lake State Park, New Mexico's largest state park, was our idea of perfection with a lake to swim and play in, camping directly on the beach, hot days and cool nights, and the best part of all...it was MARCH! It was here that we enjoyed one of our favorite cotton candy-colored sunsets. Elephant Butte Lake also offers boating, fishing, kayaking, and hiking but we didn't venture far from Spud. Guess we had everything we needed. Elephant Butte campsite views. We love a good beach site! A kite flying kind of afternoon. Getting a little work in on the road. This place is just as the photos depict: a sand dune dreamland. At least when the wind is at bay, that is. Thankfully it was for us. Check out our blog post dedicated solely to showing off this incredible national monument. It's a place not to be missed, I assure you 1 gazillion percent! My boys summiting a dune at White Sand Dunes National Monument. Lunch stop on a Sunday afternoon in a tiny town with nothing open. Chip just burped sending the boys into a laughter fit. In the middle of nowhere, New Mexico one of the world's most fascinating cave systems exists. Pictures, stories, and google reviews can't hold a candle to how one feels when experiencing this cave in person. Chip and I might consider ourselves mild cave lovers. We've dabbled in some in North America, New Zealand (if only every cave had glowworms! ), Vietnam, and Europe but Carlsbad Caverns is uniquely rad in its own way. I wasn't quite sure we were going to make it to Carlsbad Caverns this go round because seriously folks, it is off the beaten path. In the back of my mind I also felt hesitant about the hike with the boys. At this time they had just turned four years old. It's steep, strenuous, and all underground. Perhaps this was one instance I should not have scoured the internet reading reviews of other people's toddlers screaming or whining the entire hike into the cave and out. But here we were, strapping on our hiking sandals and scarfing down PB&Js in the parking lot of Carlsbad Caverns. When in Whites City, I always say....... (and I only "always" say that because there is literally nothing to do in Whites City but visit the caves). Headlamps - Check. Grippy shoes - Almost check. Energy - Check. Water - Check. Warmish clothes - Check. We apparently came at the best time in decades because the elevator that normally takes people to the bowels of the cave and back up was out of service (WAY fewer people than usual). If you're like me, I too scoffed 'What the what? There's an elevator in a cave?!" I guess I just assumed the only way in was to hike. But you know what happens when you assume? I'll leave that for you to figure out but yes, I most definitely miscalculated the sheer size of this cave plus the annual number of visitors, many who are only able to witness it via elevator. Thank you, modern engineering. This cut down on the crowds and our experience was pleasant from the get go. After zigzagging through the natural entrance we finally dropped quickly into the cool, damp, and majestic cave. Within seconds we were ooh-ing and aah-ing over stalactites and stalagmites. Our energy spread to the boys and they too were amped up by the unique wonders of the underground. With no natural light and only the hushed noise from the other visitors this place felt otherworldly. Plenty of different size rooms unfolded before our eyes giving way to some of the most fascinating cave structures we've laid eyes on. It was impossible to capture in a single photo so you'll have to trust us when we proclaim: You gotta see it to believe it! Ried is about to descend to the underground, headlamp, baja hoodie, and all. We continued to descend lower and lower and (much) lower. My quads were starting to bark. The entire length one way is 1.25 miles and 750 feet down, equivalent to walking down then back up a 75-story building. The boys hadn't balked yet but we knew the way up would be much more strenuous. Upon turn around we made a deal. If the boys could make it back up without complaining or being carried they could have a sucker. Heck, make it two, we exclaimed. The only mishap was when Bennett tripped over a rock sending him flying through the air in the darkness. It took him a minute or two to regain his composure but we emerged tear-free and grateful for the experience. One of the windiest days of the whole year was upon us. Like turbulence of an airplane, a gust of wind would come out of nowhere and nearly run Spud off the road. Not to mention, we (Chip) picked the most narrow county road with non-existent shoulders. "Let's go there, when else would we ever be in the southeast corner of NM?" It was one of those times I had to close my eyes and trust we were going to make it out alive. After a couple hours I decided my armpits had done enough sweating (and my brain enough worrying about impending death) that I looked to the nearest town for camping. Here enters Jal, New Mexico. Population 2,121. Our Jal Lake Park RV Site in Jal, NM. We saw online that Jal Lake Park offered free RV camping with electricity, a shelter, picnic tables, bathrooms, playground, a man-made lake stocked with trout, and walking path. All this for free? It seemed too good to be true. After we popped the top and unloaded our belongings an older gentleman rolled up in a white pick-up truck. Standard fare at this point, one of the best things of being on the road is constantly meeting new people. Fast forward to fifteen minutes later as Reid, Bennett, and I are waving goodbye to Gene, the older gentlemen, and Chip as they take off for a tour of the town. Nearly two hours had gone by and at that point I had already decided Chip was abducted by the sweet old man in the white pick-up truck. But shortly after my nightmarish daydream, here they came cruising up next to Spud with childlike grins on their faces. I too got the opportunity to ride shot gun with Gene which included sunset at "The Trail Ahead" sculpture (see below). Gene had story after story to tell and they were all fascinating. From flying the fighter planes in the Pearl Harbor movie (yes, Ben Affleck & Josh Hartnett!!!!) to helping weld, move, and place the western sculptures to attending city council meetings year after year until his proposed lake, rv park, and playground were approved. Which brings us to Jal Lake Park. Little did we know pulling up that we would be meeting the man behind the plan. His vision would ultimately lead people to experience Jal and that is exactly what he had wished 30 years prior. The following morning he came and invited us to breakfast. To which we quickly said "yes". Jal probably would not have been anything to write home about had we not met Gene. Gene changed Jal from a place to spend the night to an experience and memory we won't forget. He is the true definition of welcoming and he does it with a huge heart. It was a good reminder for me to be open and not shy away from those we meet for everyone has a unique story to tell. I can't imagine this year without the story of meeting Gene Armstrong in Jal, NM. If ever there, look him up. He's one of a kind. Up close at "The Trail Ahead" sculpture with Gene. Chip and Gene after their joy ride around Jal, NM. "The Trail Ahead" sculptures from afar. Jal Lake Park Views, Jal, NM. Type of sand at White Sands National Monument: Gypsum, which means it wasn't hot to walk on, and never will be! Items we immediately purchased after spending 48 hours at the Gila Hot Springs: Lotion (a giant bottle) and chapstick. Our lips hurt real bad!